In May of 1980, "Call Me" by Blondie was the #1 Billboard single and in Portland, Oregon, the employees of six year old Bullseye Glass Company kept an anxious ear to the news reports of the steam and temblors emanating from Mt. St. Helens 50 miles to the northeast. Then, on May 18, after two months of fitful activity, Mt. 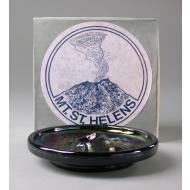 St. Helens erupted violently. That major eruption disintegrated 1,300 feet of the mountain's peak sending a plume of volcanic ash to 80,000 ft which then, carried by prevailing winds, fell east across the entire country to the Atlantic Ocean. One week later, on May 25, a subsequent smaller eruption and a shift in winds brought ash to Portland, Oregon. The glass chemists of Bullseye Glass, having had this base material rent from the earth deposited literally on their doorstep set out to formulate a glass based upon it. Then, in collaboration, artist Curtis Jewel was inspired to sculpt a commemorative rendering of the mountain in its newly modified shape. The Mt. St. Helens form you see here is the result. Made of volcanic ash from the fallout, fused at 2600°F to form volcanic glass, and handcast in 1980 at Bullseye Glass Co., Portland, Oregon. A piece of history from the archives of Bullseye Glass Co., available for a limited time only. Dimensions are 5" diameter x 1" at dish rim (1.125" at caldera rim).